Planet Krypton was one of many business ventures attempted by Booster Gold over the years. 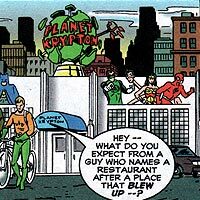 This super hero-themed restaurant is in many ways similar to Warrior's, the bar owned and managed by fellow JUSTICE LEAGUE member GUY GARDNER. Booster Gold established Planet Krypton with silent partner RIP HUNTER. Despite being a public restaurant with regular human employees such as Rose D'Angelo, the restaurant was the site of much time and dimension travel oriented adventures during its operation.